For the first time, researchers have been able to track the movements of puffin populations in the winter – a breakthrough that they hope will help provide clues to ensure the long-term survival of the species. In an international study involving researchers from the University of New Brunswick, scientists were able to track the cold weather habits of puffins in the North Atlantic. Over the course of eight years, the team studied the seasonal behaviours of a wide range of puffin colonies across the species’ range. By combining data from multiple colonies, the researchers were able to build an accurate picture of the migration behaviours of Atlantic puffin colonies across the world. “This is important because most of the mortality for seabirds takes place in the winter,” says Dr. Tony Diamond, a University of New Brunswick ecologist who undertook the study led by the University of Oxford and conducted in collaboration with eight partners around the world, including the University of New Brunswick, the Norwegian Institute for Nature Research and the South Iceland Nature Research Centre. “Gaining new insights into their movements and behaviour in the winters is vital to understanding the survivability of puffins. If they come back to their summertime breeding grounds having had a tough winter, they are much less likely to breed successfully,” says Dr. Diamond, a professor emeritus with the Atlantic Lab for Avian Research at UNB. 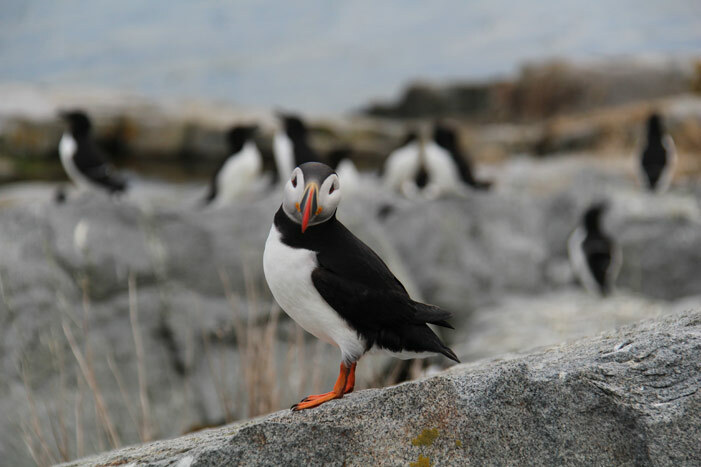 Dr. Diamond and colleagues tracked puffins from the colony at Machias Seal Island, N.B. for the study, published on Nov. 30, 2017 in the journal Current Biology. By outfitting birds with tags that detect light levels and measure time, the researchers were able to trace how far the puffins travelled, calculate the energy they used and whether they mixed with other colonies. “By comparison to other migratory species we know very little about puffin migration. Previous studies have tended to focus on individual colonies, particularly British and Irish colonies, and actually that is only a very small percentage of the puffin population – the biggest colonies are found further North, such as in Norway and Iceland,” says Dr. Annette Fayet, lead author and a junior research fellow of Queen’s College, Oxford and of the department of zoology at Oxford University. While the study has not provided any insights yet that will help bolster the puffin population – endangered in parts of Europe – Dr. Diamond says it is an important step. “Puffins are not endangered in North America. But what is happening in Europe is probably going to happen here before too long. There are some early warning signs in puffin biology that mean it is important that we know where they spend the winter,” Dr. Diamond says. “We can start to track ocean changes in the winter range as well as the breeding range, which we haven’t been able to do until now. It’s going to take some time to digest what we have uncovered and see what the implications are. But it is a tremendous amount of new information,” he says.